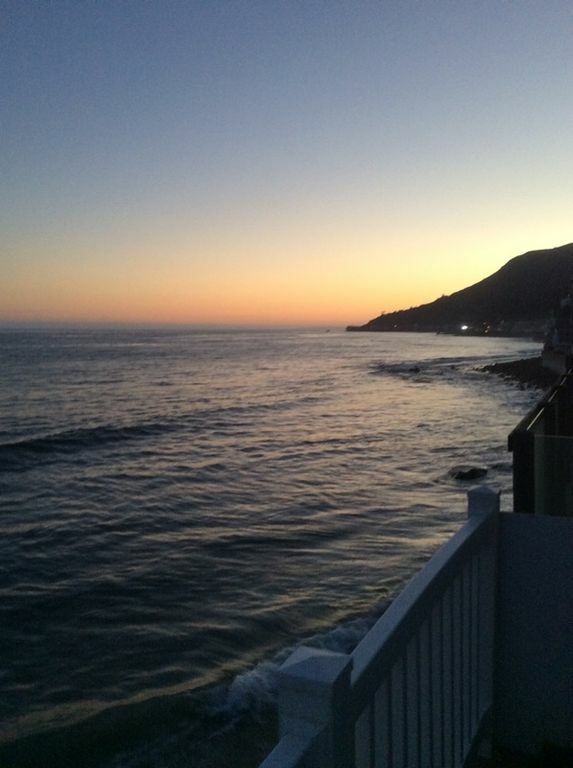 You work hard now come play hard in serene Malibu. It will restore your soul. ! This is the one you're looking for... a petite zen oasis. This Kimpton boutique hotel inspired beach cottage will allow you to have a glass of wine and unwind and learn the true meaning of love again. Located close in, right on the sand in Topanga Beach, you will find that you've chosen the best location to launch your local exploration. From here, you can visit sites in Malibu, The Venice board walk , The Santa Monica and Malibu Piers.and Pacific Palisades all in one day. Enjoy wine tasting at Rosenthal’s winery, which is located just across the street, and walk to the world famous Maestros Ocean Club for surf and turf. Nobu, Gladstones for Fish, Geoffreys, Dukes and Moonshadows are just a few local restaurants from which to choose. Feeling adventurous? Hike just across Pacific Coast Highway to the Topanga canyon trails and take in the ethereal panoramic view of the Paciific. From our balcony, the view will make you will feel as though you were on a Cruise ship. Looking out the sliding glass doors to your private balcony, is like watching an ever changing live painting. Come watch the dolphins dance and the moon rise out of the blue pacific at night from your jacuzzi. Great spot just 5 mins from Santa Monica and Malibu. Right on the ocean with the waves crashing on you night and day. Everything was perfect and the owner was very attentive and accommodating . You cant go wrong here. I rented this amazing property as a birthday gift for my mom. She had just turned 94 and is an ocean buff. It's hard to find anything better right on the beach. She stayed there with a friend and I ended up staying a few nights myself. It's upgraded and modernized and very comfortable. The upper deck was really where we spent most of our time enjoying the beauty of the ocean during the day and into the night. The lower deck comes with a very roomy above-ground jacuzzi and was a welcome soak after taking some ocean dips. You really can't miss by renting this Malibu property. I rent a lot of luxury properties for vacations and while I'm at professional meetings and on the lecture circuit. I recommend this one highly. My family and I stayed in this amazing home for 5 days to start our two weeks in L.A. and wished all two weeks had been here. Our arrival was hassle free and everything was as described and even better. We spent our days jumping in the ocean and then running to jump in the hot tub. Malibu Mart and a host of great restaurants are close so no need to stray far from the house since it really is hard to leave. Thank you Tony for accommodating us, look forward to coming back. Simple process to book and representatives were always responsive, even to a very minor issue we had that they helped with right away. Looking forward to renting again. This is a great size for our family. We walked to Topanga State beach two of the days (not enough room in front of the house to go down to the beach and get in the water right at the house.) Great location made for a perfect getaway that was close to home. A great location on PCH (don't worry no traffic noise), nicely located for Santa Monica, Malibu, Topanga etc. Property is fully equipped and furnishings and linens are top quality. Owners representatives are easy to get hold of and easy to work with. would definitely book again. No honest offer will be refused... tell me what it's worth to you and we'll work it out In the past, Guests have paid on average $2850 weekly depending on demand and season. lower in the winter, higher in spring and summer. Returning guest may be eligle for a free night if available.